This has been the first week that is has actually felt like fall here, so I don’t feel quite so guilty posting apple and pumpkin recipes. Mornings and evenings are crisp enough to want a toasty jacket, and even the midday temperatures still have a cool breeze that rustles the few leaves already on the ground. It all makes me want to pull out my boots and grab a Pumpkin Spice Latte and go apple picking. I’ve never actually done all those three things at once together, but it sounds idyllic! If you have a chance to try all three of those things together, let me know how it is! 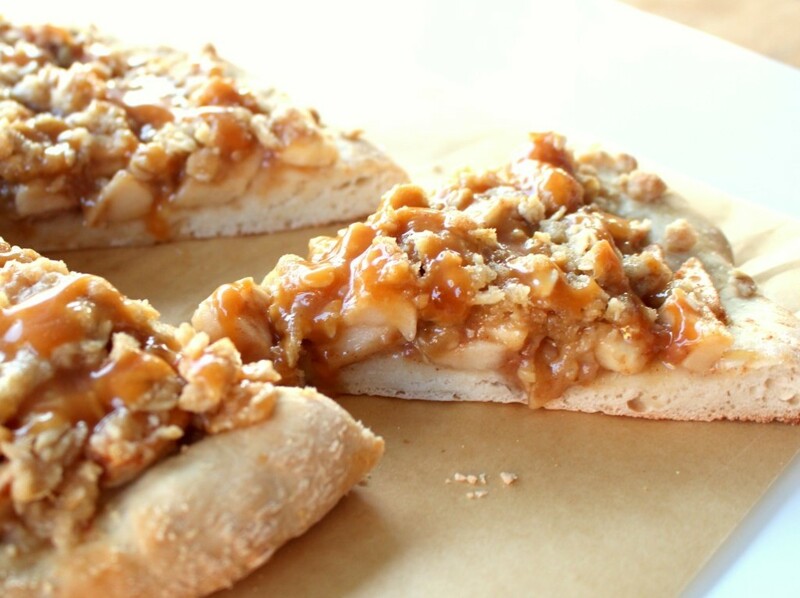 I do know the first thing I would make with those apples, after I pick them: this apple pizza. 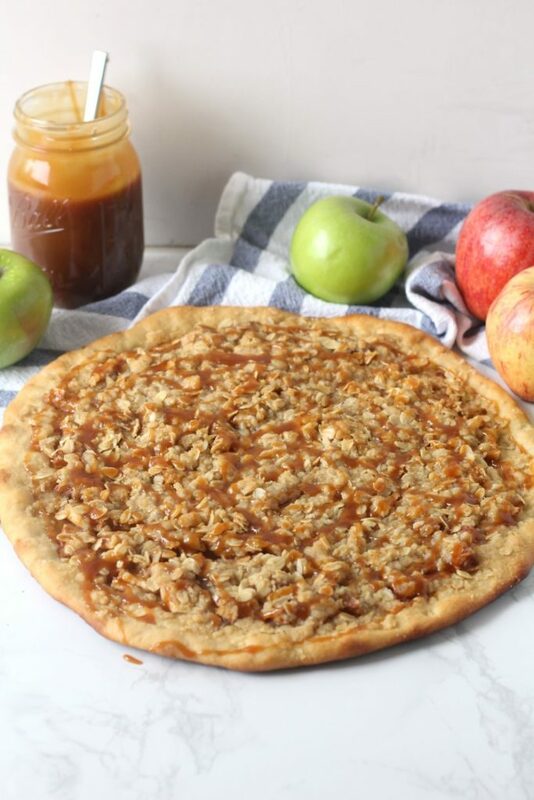 It might be a hard choice between this pizza and apple pie. And my version has extra apples and streusel on top. Some versions are basically all crust with a sprinkling of apples. This version has a thick layer of soft cinnamon apples and sweet streusel. Plenty of apple goodness for every bit of crust. The crust for pizza is very easy to make. It is an adaptation of my ever day pizza crust recipe, but basically I swapped out the bit of regular sugar for a little extra brown sugar. 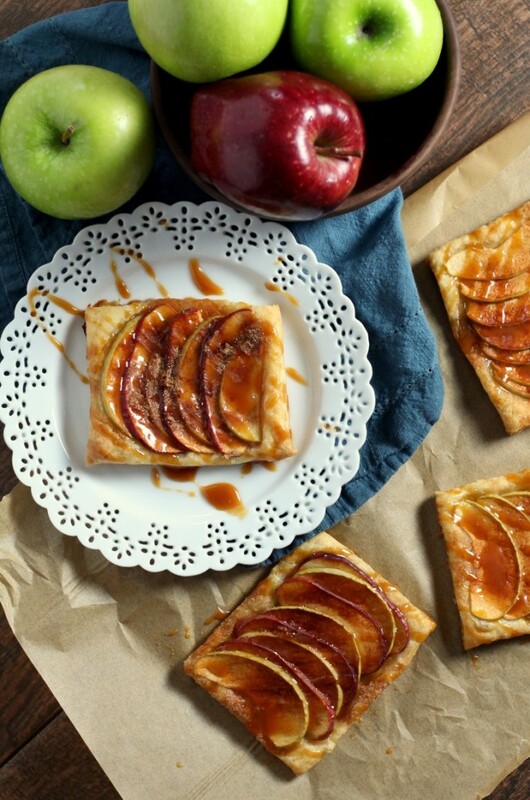 It gives the crust a hint of sweetness without taking away from the apple flavors. After the crust comes a layer of apples and cinnamon, topped with the best streusel. It bakes up like a regular ole pizza, but is so much better. The best way to serve it is warm with extra caramel and a scoop of vanilla ice cream. 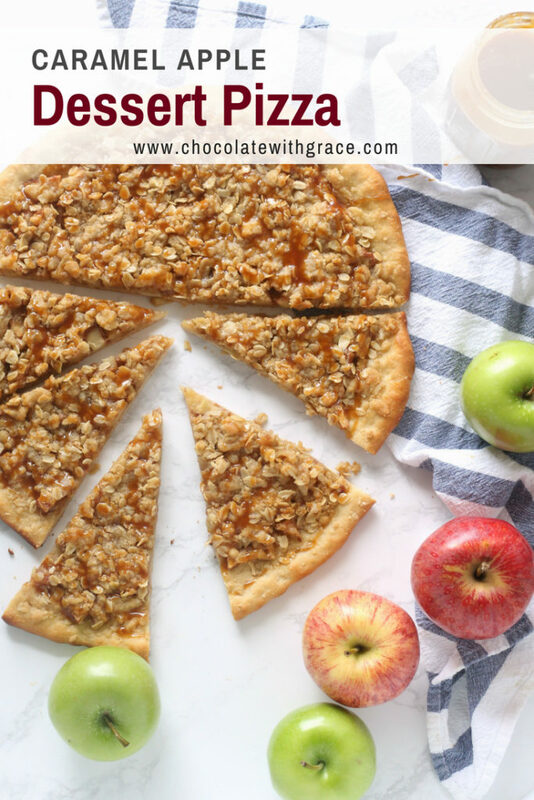 Be sure to dice the apples very small, otherwise the won’t cook as quickly as the crust and you’ll have crunchy apples on your dessert pizza. The first time I made this, I made it a 12 inch pizza and it turned out thicker. Take a look at the original photos to see what I mean. This time, I wanted a thinner, pizza hut apple dessert pizza style crust so I made it a 15 inch pizza. It was also delicious with a more crispy crust. Take you pick, just know that a thinner pizza will take less time to bake, so check it sooner. To make the crust, combine hot water and yeast in a large bowl. Let sit for a few minutes until a foam develops. Stir in the brown sugar, olive oil, salt and flour. Knead for a few minutes until dough is stretchy. Let sit for 30 minutes to rise. Meanwhile, peel and dice the apples. Toss them with the flour, brown sugar, cinnamon and nutmeg. Grease and lightly dust a pizza pan with cornmeal. Preheat oven to 400 F. Pat out the dough into a 12 - 15 inch circle. Lightly brush with olive oil. Spread the apples on top of the dough. To make the streusel, mix together the flour and brown sugar. Cut in the cold butter until it makes pea-sized crumbs. Gently stir in oatmeal. Sprinkle over the apples. Bake at 400 F. for 28-22 minutes or until the apples are tender and the crust is browned. Let cool slightly. Serve warm with caramel and vanilla ice cream. 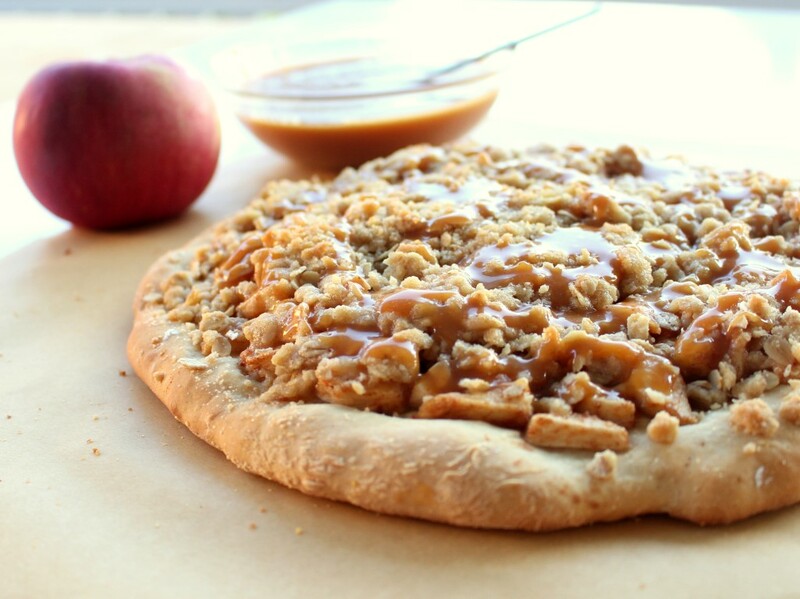 Here are some other Dessert Pizza Recipes from bloggers around the web that sound amazing. 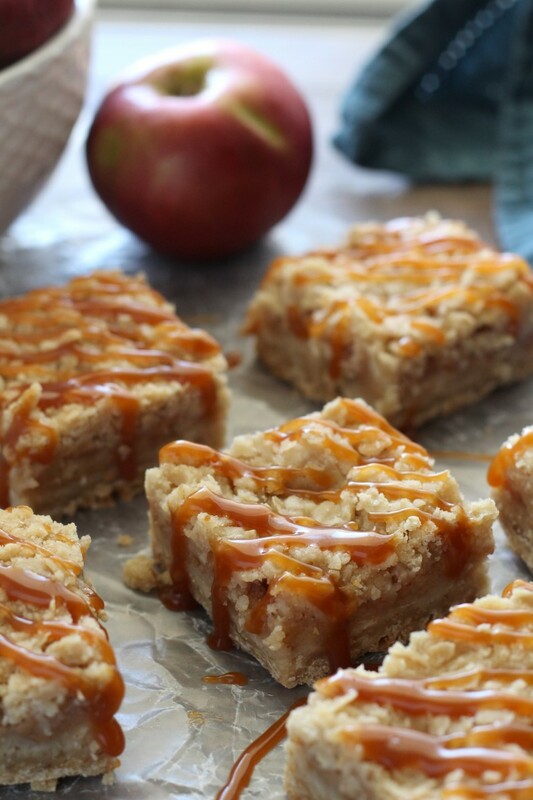 And if you’re looking for more caramel apple treats, check out these other recipes on my blog. You are rockin’ my world! I love everything about this! 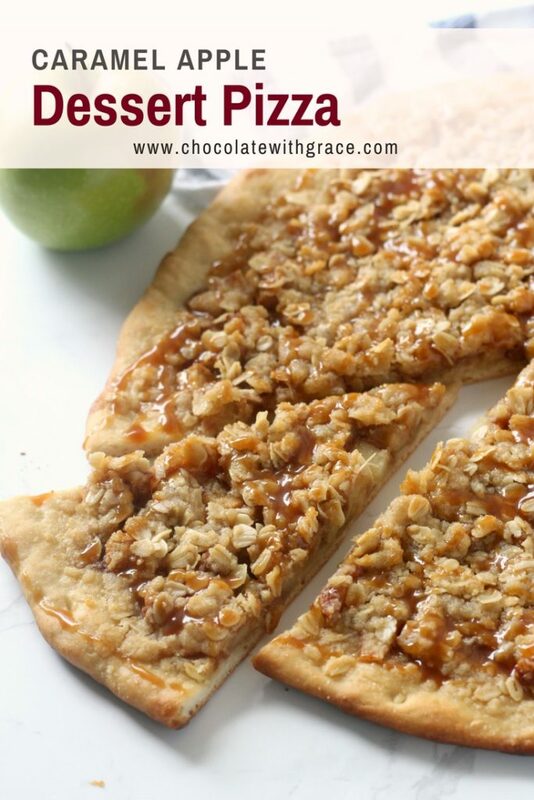 Love this dessert pizza! Extra caramel and ice cream are a must! What an awesome idea!!! Nothing beats caramel apples here. Add a scoop of vanilla ice cream on top and it’s the perfect treat! That streusel crust is making me drool. I just adore it. Great minds thing alike! I posted a caramel apple dessert pizza this week too! Yours looks amazing Mallory! 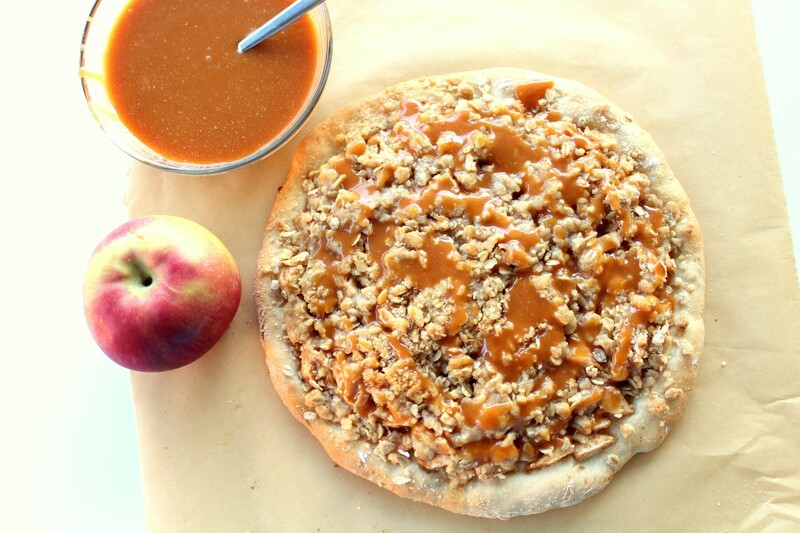 One of our favorite restaurants has an apple dessert pizza, but they need to add the caramel like you! Again, you got me with the streusel! I love dessert pizzas! Looks fantastic! Thanks, Amber. The streusel is one of my favorite parts too! Hmm….I have half a whole wheat pizza dough recipe sitting in the fridge, I wonder if it would work? Maybe if I brush the crust with some reduced apple cider and caramel 🙂 Thanks for the inspiration! Yeah, it will be a bit heavier than a normal crust, but I’m sure it would work out great! This looks delicious! Funny enough I’ve made a similar pizza and this just reminded me that I should definitely resurrect that pizza – yum yum! Oh dear – I need a towel – I am drooling like a flowing river over here! the streusel topping …the apple filling…the cinnamon…I cannot even think …so so good! can I unroll a pre-made crust for this? Absolutely, that makes it a super easy dessert. Just be sure to bake it according to the package and to use nice ripe apples. Enjoy! This looks so fun! I help teach a cooking class at our church’s Community Center and this would be an ideal recipe for our moms (and even a few dads) to make for their families! Good to know that they can use a pre-made crust for this recipe, as we have come to realize that homemade crusts tend to be frightening for some. So excited to try it! Thank you! Now THIS is my kind of pizza. YUMMY! I have to try this! It looks amazing! Oh wow, this right here has to be made!! I seriously want to dive right in! Which type of oats? Cut, instant, quick? Your cooking time says 28-22 minutes?